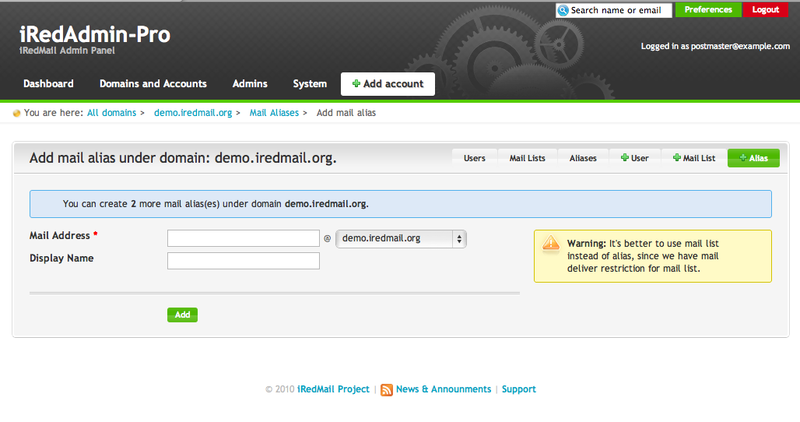 Log into phpLDAPadmin as LDAP root dn cn=Manager or cn=vmailadmin. Expand LDAP tree in left panel, click Create new entry here under ou=Aliases of your domain, and select Default in right panel. Select object class mailAlias in right panel. Input required fields of mail alias account. WARNING: Attribute enabledService requires two values: mail, deliver. Add missing value for attribute enabledService: mail, deliver. Add new attribute accountStatus with value active. This is required. Add alias members (full email address) in attribute mailForwardingAddress. You can add as many members as you want.